On a recent vacation I took a batch of videos of old TV shows with me for evening entertainment. 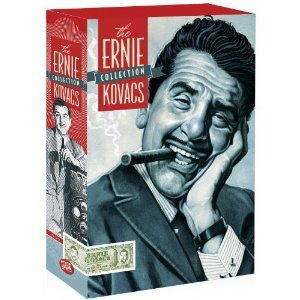 One of them, which I had been eager to start watching, was a set called “The Ernie Kovacs Collection” (Shout! Factory SF 12359) . I loved Kovacs when I was a teenager and he was still broadcasting, and since his death I have always looked for opportunities to see some of his work. I still have tapes of a Kovacs series broadcast on Comedy Central Sundays at midnight, and I also have an earlier Kovacs DVD issue. But this is the most extensive Kovacs collection ever issued, and I’m sure I’ll be enjoying it for months. He was a comedy genius and a visionary in the use of television as a medium, and although his work is dated technically its imagination remains fresh. Kovacs was a great classical music enthusiast and often used classical pieces in his programs. But I’d never seen a one-hour special called “Kovacs on Music” until this publication. It was originally broadcast in 1959, done with a full orchestra, conducted by Andre Previn! Most of the items use music as settings or background for comedy, but there is one completely serious performance: the opening aria from Villa-Lobos’s “Bachianas Brasileiras No. 5,” sung by Kovacs’ wife Edie Adams. Adams was a successful pop singer, and she continued to have something of a career after her husband’s death. (She made enough money to pay off in full a $500,000 tax debt he had left.) But I had no idea she had the classical chops to perform this difficult music. And after hearing Joan Baez’s miserable attempt to sing the piece, as soon as I heard the announcement of what was coming I expected the worst. I was totally surprised. Adams’s is one of the most beautiful performances of the music I have ever heard, even to the very difficult pianissimo humming at the end. She was actually a Juilliard graduate in voice, and fell into pop singing almost by accident. If I were more familiar with Los Angeles cellists of that period, I’d probably recognize some of the cellists, too. Another item I brought with me is one of Mill Creek’s super-bargain video sets, Essential Family Television , a 12-disc set with 150 programs on it (no catalog number that I can find). Of course most of them are junk that nobody in his right mind would want to see today. And some of the promising items (like a Phil Silvers special co-starring Jack Benny) turn out to be disappointing. But the Jack Benny programs are still quite entertaining, and although the two Buster Keaton Show episodes aren’t very good it’s always a great treat for me to see Buster in action; he’s one of my heroes. One evening I decided to try a Milton Berle show. I hadn’t seen Uncle Miltie in years but I remembered him as being pretty funny at his best, and there had to be some reason why for several years he had the most popular show on television. Sure enough, the first (of five) episodes began with some frantic but pretty funny comedy. It was a weekly program, and nobody could have come up with and performed live that much wild comedy every week, so the program was always filled out with guests, some comedians, some musicians. About 2/3 of the way into the show, Berle introduced an amazing 15-year-old violinist, and I shouted in astonishment when he announced the young man’s name: Michael Rabin. I’d never seen Rabin on video before. He played Kreisler’s “Tambourin Chinoise” (the title never announced) like the young master he was. That two minutes justified for me the cost of the entire set. Incidentally, a few minutes later Vivienne della Chiesa showed up for another wonderful performance. Classical music on commercial TV was not so rare in the past as it is now. Johnny Carson would often have celebrity classical performers as guests, and they would show up on other programs with loose enough formats. In December of 1964 I saw my friend Jacob Lateiner playing a Beethoven Piano Sonata on a Sunday morning arts program over Channel 4 New York (WNBC-TV). The most recent such use of classical performers I’ve seen was the Colorado Quartet playing Piazzolla on “Penn & Teller’s Sin City Spectacular” over FX, and that was a good decade ago.